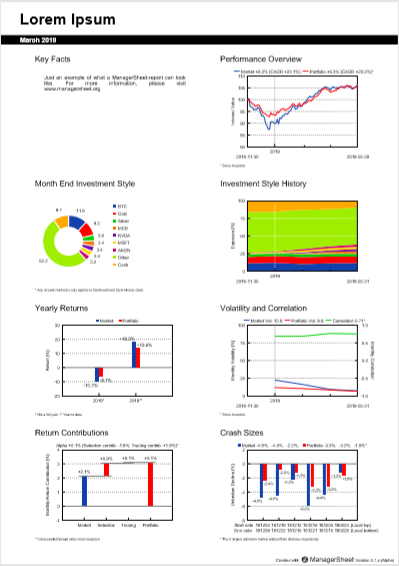 ManagerSheet is an Open Source tool that analyses and presents an investment portfolio in one single page. The idea with ManagerSheet is to analyse an investment portfolio and to provide a condensed, but still profound, view of a portfolio manager's investment profile on just one single sheet of paper (a one-page pdf-file), and thereof the name ManagerSheet. On one single sheet, ManagerSheet provides an unbiased view of properties like e.g. style drift and trading contribution, which is crucial information for an investor, but also for the manager himself, but nevertheless, this kind of information is rarely covered in portfolio/fund reports. Feedback is always welcome, and please note that the project currently is in alpha-state. In order to get going, please follow the steps below. ▪ Download the file mnsh-version-[latest version].zip from and extract. At this point data must be imported in order to create any report. The following steps will import a couple of test-files available in the src-directory. These files have only been constructed for the purpose of testing functionality. Anyway, these files are enough for creating a report, and one can inspect these files, and create corresponding files with one's own data in order to create one's own reports. In order to continue with imports of portfolio specific information, such as positions and transactions, a portfolio must be created. ▪ Create a portfolio with Portfolios > New Main and make the following selections in the dialog: Pick any name, e.g. "Test Portfolio"; Leave Key facts blank, or type in just something for the sake of it. ; Set the Inception date to 2018-10-31; Select the only possible base currency, i.e. SEK; Select the only possible benchmark, i.e. URTH. ▪ Answer "Yes" on the question whether you wish to initiate the new portfolio with positions and/or transactions. ▪ In the Import Transactions and Positions from File dialog select the following files: Transactions file mnsh_test_transactions.csv; Positions file mnsh_test_positions.csv, and set the positions date to 2019-01-31. Now we are set to create portfolio reports. ▪ Create a portfolio report for Jan 2019, with Report > Create. Now a portfolio report with the name report.pdf has been created, and can be found in the src-directory. Disclaimer: This website (www.managersheet.org) is provided "as it is" without any warranties of any kind whatsoever.